Lately I've been a sucker for a lip stain (I personally blame Rimmel and its apocalips), give me a product that I hardly have to touch up during the day and I'm sold. I first bought one of this L'oreal caresse wet lip stain (long name) on a wimp, I'd been reading a lot of reviews and I wanted to know what the hype was about, well let me tell you, the hype is well deserved. As many of you know this are supposed to be a dupe for the YSL ones, but a lot (LOT) cheaper, they work pretty much the same way, you are supposed to apply three coats (giving it a sec to dry in between) and you really get the color you see on the tube. I haven't really done the three coat thing, I gave it two coats and I got a pretty strong color. I really like three things about this, first the packaging, I have to congratulate L'oreal on its new range and packaging, I so doesn't look drugstore but a lot more high end. Second, the shades, they have a lot of different shades, from pale nudes (both peachy and pink), pinks, plums, purples, reds both pastely and strong (when usually with stains you get about four or five shades). and third the finish, when you first apply them, they look like a gloss (which, unlike other stains, stays for a long time) and after you've rubbed you lips, eaten or drunk and the gloss rubs off, your lips get stained (when I swached them on my arm to take the picture above, the stain stayed for a long, long time). This three shades are Milady (a dark plumy color that you can work sheer or build it up), Eve (a light pinky lilacky color which comes sheer on the first coat but after the second you get the color out) and princess (a peachy orange perfect for summer). Have you tried any of this or any other stain? what's you favourite one? 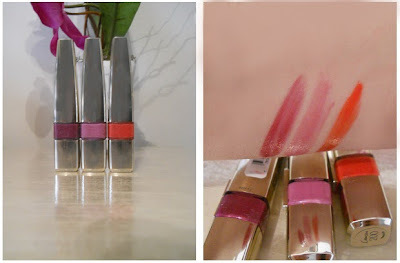 I love YSL's lip products - especially their lipsticks - but I have to say, I actually like these better than the YSL lip stain. Maybe it was just mine, but my YSL one got really clumpy, kind of like how mascara gets when it goes bad, and for the price, these L'Oreal ones are so much better! Princess is so pretty! I was thinking of buying this when I read loads of good reviews about it - I definitely will now! Lovely post & cute blog! Hola guapa, gracias por la visita! Me encanta tu blog y te sigo a partir de ahora!! Pásate a visitarme cuando quieras^^ Estamos en contacto. Ohh I really like these! I think I will have to grab one next time I'm at the drug store! I love Milady and Princess, the colours are gorgeous and I'm really bad at reapplying lipstick throughout the day so these sound perfect! I have a love hate relationship with these! Great post though!! I'm also suuuuuuper excited about lip stains! I totally need to try some myself and was eyeing L'Oreal products too. Thank you for stopping by at my blog and leaving a comment. I enjoyed reading this review. You explained and showed everything well and I might give the peach lipstain a try. Thank you for introducing! These lip colours look beautiful! I heard that these are pretty good, I think I might go buy some soon! Thanks for stopping by my blog btw!